The Murderer Lives at Number 21 is a 1942 film, the directing debut of Henri-George Clouzot, who co-wrote the script with Stanislas-Andre Steeman. I've mentioned Steeman before in relation to his very interesting novel Six Dead Men and the film imports from that book the detective Wens, played by Pierre Fresnay. It's a serial killer whodunit mystery with plenty of comic touches - a remarkable mix, given that the film was made during the German occupation of France. We learn right away, in a pub scene, that a murderer who leaves the calling card of "Monsieur Durand" is terrorising the city. A vivid Hitchcock-style sequence sees a drunken tramp who has just won a lottery prize becoming the latest victim. Wens is under pressure to solve the mystery, and an aspiring musical comedy actress, played by Suzy Delair, also determines to make her name by finding out whodunit. Wens is led to a boarding house - No. 21, Avenue Junot - where the murderer appears to live. The occupants are a motley crew, but although the killings continue, Wens finds himself confounded each time he seems close to identifying the culprit. The explanation for the puzzle, when finally revealed, is pleasingly quirky. Hitchcock himself pointed out that filming a whodunit is very tricky, and Clouzot too would go on to find greater fame with stories that emphasised suspense rather than puzzle plots. But this is an enjoyable film to watch, a period piece that is lively and entertaining from start to finish. The fairly recent DVD version includes an insightful discussion by Ginette Vincendeau, which sets the film in its historical context. I'd like to know more about the collaboration between Clouzot and Steeman. Incidentally, in commenting on my post about Six Dead Men, Xavier Lechard recommended this film warmly. His praise of it was well merited. "I was ten when my best friend’s mum died of a heart attack. She was only 34 and it was tragic. Herdistraught mother fundraised tirelessly for the hospital she had been treated in, eventually helping toopen a new wing, named in her honour, using her maiden name, Valerie Storie. And that was that. Until a couple of years later, when I became curious about serial killers and the psychology behind their crimes. I came upon a chapter about the A6 Murders, the case now notorious for having been reopened in 2003 due to doubt of James Hanratty’s guilt. For those unaware of the case, married Michael Gregsten and his lover, Valerie Storie, were abducted in Dorney Reach, Berkshire, in August 1961. The kidnapper commanded Gregsten to drive along the A6 at gunpoint, finally stopping at aptly-named beauty spot Deadman’s Hill, near Clophill in Bedfordshire, where he shot Gregsten dead and raped Storie, before shooting her five times and leaving her for dead. She survived. Intrigued by the possibility of the victim being my friend’s mother (we lived near Dorney Reach at the time), I spent hours at Slough library poring through newspaper articles and photos, heart pounding as I noted the likeness of the pretty woman in the dated pictures to the memories I had from spending time with the family, aged seven to ten, before Valerie’s untimely death. I was convinced they were one and the same. I was wrong; the courageous survivor of the A6 atrocity lived until she was 77, dying in March this year, but the intense research had set a fire blazing inside me and studying the psychology of killers has since become my lifelong passion, in particular Richard Ramirez, America’s Night Stalker. Ramirez was of interest because his savage spree was happening (1984-1985) as my intrigue in killers developed. A drifter from El Paso, Texas, he brutally murdered his way through Los Angeles, famously listening to AC/DC while on the prowl. Unlike most serial killers, he didn’t have a type, and his victims ranged from painfully young to old, male and female. He would sometimes abuse sexually, always murder viciously, and left a trail of destruction in his wake, before being apprehended by the public following the release of his mugshot in a newspaper. He was sentenced to death and remained on death row in San Quentin State Prison, California, before dying of liver disease in 2013. Regardless of what was then an unusual hobby, I was sensible and became an accountant rather than the detective I would love to have been, and for years while I developed a successful business and raised a family, my free time was spent devouring true-crime books. Turning thirty, I couldn’t wait any longer to fulfil the burning desire to share the knowledge I had on the subject in novel form, and I wrote Unlikely Killer, a thriller about a copycat serial killer recreating past British murders. It wasn’t published for a further ten years, during which time I wrote prolifically, including screenplays as well as novels, short stories and articles. Last year my seventh novel was published, and this year has been spent polishing my books and releasing second editions of all but two so far. In 2011, still endlessly trying to understand why a person would step across that line and choose to take another life, I wrote to Ramirez, stating my interest and work. We shared a brief correspondence - 8 letters – before I couldn’t deal with his intense interest in my children any more (particularly my youngest son, who was 7 at the time); I stopped writing to him. Which leads to one of the most exciting parts of my career so far: having visited the True Crime Museum in Hastings last year and been absorbed by their wonderful collections, which mainly centre on serial killers, I asked if they would be interested in exhibiting my collection, and luckily they agreed. So later this year I’ll be heading south to lend them the letters, complete with photos, hand-drawn pictures and cards. As far as I know it will be the first Ramirez exhibition in Britain, a useful study for those who, like me, find the psychology of killers fascinating. I have a million and one more ideas for novels and screenplays, finding inspiration in the most trivial of events. I can’t imagine following a different career now, and I hope that my work will help readers in some way to realise that killers are vastly a product of a broken society, a series of greys between the accepted black and white, rather than simply ‘evil’. All of a sudden, we are living in extraordinary and uncertain times. I suppose it's true that throughout my life I've found reading and telling stories a means of escape from the real world, as well as a way of trying to make sense of it. So I'm absorbing myself in the reading and writing life at present, and what better way to so so than by attending a book festival in an agreeable and unfamiliar part of the country? I was delighted to be invited to speak at Felixstowe Book Festival this year. The Suffolk resort is at the other end of the country from where I live and I've never been there before. A very long train journey culminated in my arrival, quite literally, at the end of the line, and I undertook a short reconnaissance of the resort before the day came to an end. During the morning, I enjoyed visiting the town's very good bookshops, and walking along the lengthy promenade. past the old Martello tower, to Landguard Peninsula and the old fort there. It all seemed quintessentially English, and very pleasant. Then it was back to the hotel for a talk about Golden Age detective fiction with Rob Davies of the British Library. The organisers had done a great job in achieving as sell-out of all 50 tickets, and we enjoyed chatting with ace blogger Elaine Simpson-Long about the astonishing revival of interest in traditional crime fiction from the Golden Age. Saturday had begun with an enjoyable breakfast with Julia Jones, Margery Allingham's biographer,and Daniel Hahn, who was responsible for the Oxford Companion to Children's Literature and is a former chair of the Society of Authors. One of the topics we talked about was the writing life - and how social media, and taking part in events,occupies so much time these days. My trip to Felixstowe,for instance, really took up three days in all that could otherwise have been devoted to writing. It's fun to do such events (especially for me, given that I could hardly ever manage such things in the days when I was a full-time lawyer), but of course one needs to strike a balance. Daniel said some writers do a hundred or more events a year,but I'd never be able to manage anything like that - it would interfere too much with the writing. But at least on the lengthy journey back home the trains were less like crowded cattle trucks than was the case on Friday, and I was able to get plenty of reading done - one book for which I've been asked to write an intro, and a yet-to-be-published Kate Ellis, of which more at a later date. All in all, an excellent week-end of escapism. A Graveyard to Let, my Forgotten Book for today, is a novel by Carter Dickson (aka John Dickson Carr) first published in 1949, and featuring Sir Henry Merrivale. Unusually, it's set in the author's native USA, with that extrovert Englishman Sir Henry causing chaos from the moment he arrives in New York. There are several comic scenes, and although I don't find Carr's humour as irresistible as his scenarios, there's certainly an excellent puzzle to solve. With this lead-up, Manning dives - fully clothed - into his swimming pool. But he doesn't come out again. His clothes are found, but there is no sign of him. What on earth has happened? It's a highly intriguing "impossible crime" scenario, one that has been widely admired. Nobody has ever done this sort of thing quite as well as Carr, and certainly not with such consistency. That said, I felt that the book was flawed in some ways. For me, the solution did not live up to the brilliance of the basic premise, and the characterisation struck me as some way short of Carr at his best, with motivations that I struggled to believe in. I continue, on the whole, to prefer the Gideon Fell books to the Merrivales, but even so, the concept of a man disappearing completely after diving into a pool is memorable enough for this book to be worth a read. Below-par Carr is still, in most cases, pretty good. Murder Intended, one of five police novels written by Francis Beeding, first appeared in 1932. It sank from sight fairly rapidly, and I know that John Cooper, who wrote an excellent article about Beeding's police quintet for CADS four years ago, doesn't rate it as highly as the other four. But I found it very readable, and also innovative. Beeding strays far from the conventional, and this may disconcert some readers, but I found the story refreshingly different, and it has stuck in my mind. It all begins in very orthodox fashion, though. The Delft clan come together for an annual gathering prescribed by the will of the late Jasper Delft. Members of the family are dependent on the goodwill of Jasper's widow, Agatha, and woe betide them if they don't turn up. Almost inevitably, the conversation turns to what would happen if Aunt Agatha were no longer around. What about murdering her? Seasoned readers of Golden Age detective fiction will settle down in anticipation of a mystery where Aunt Agatha comes to a sticky end, and the finger of suspicion points at one after another of her impoverished relatives. But they will quickly be surprised. When a murder does take place, it is of a very unexpected kind. I won't say too much about the plot, although a key development is revealed at an early stage (this was the aspect of the book that John didn't care for.). I see the book as an experiment with a form of inverted mystery - although we know whodunit, the fascination lies in seeing whether the culprit will be apprehended before further mischief is done. Beeding builds the suspense nicely in the second half of the book, and in some ways the Beeding novels strike me as forerunners of the work of Michael Gilbert, another smooth writer who never liked to repeat himself. I'm only sorry that, due to their fondness for writing thrillers, they didn't produce more detective stories. The Link is an Anthony Gethryn novel dating from 1930, and written by Philip Macdonald. I've mentioned my enthusiasm for Macdonald several times on this blog, but this book is one I first read in my twenties, and found disappointing. I decided to give it another go, to see whether my earlier judgment had been too harsh. Macdonald liked to ring the changes in his novels,and here he gives Colonel Gethryn a "Watson" figure, a vet called Michael Lawless, who narrates the story. (Lawless was obviously a name that appealed to Macdonald: one of his pen-names was Anthony Lawless). Lawless is hopelessly in love with the young and charming wife of a deeply unpleasant "beer baronet" called Grenville who has spent several years in America. An unexplained mystery of this book is why she was ever stupid enough to marry such an odious chap. Lawless' passion seems destined,however, to remain unrequited. At a lunch party hosted by Grenville, Lawless meets Gethryn, and the two men join forces shortly afterwards, following the murder of Grenville. He has been shot, and his body has been moved at least once. The local publican, Dinwater, is arrested - he had been Grenville's batman, but the two men had recently fallen out. Gethryn is not, however, convinced of his guilt and, with Lawless' help, sets out to discover whodunit. This book has its admirers, but when I first read it, I felt that its supposed ingenuity came to nothing, because the crucial red herring was emphasised with such tedious insistence that one was bound to be sceptical about it. The plot trick involves a type of deception that Agatha Christie deployed, but with much greater finesse. Ngaio Marsh's Vintage Murder, first published in 1937, is a good example of the well-crafted Golden Age whodunit. It gains strength from being rooted in two worlds with which Marsh was very familiar - New Zealand, her native country, and the world of the theatre. Inspector Roderick Alleyn is travelling on North Island for the good of his health, but of course, wherever a Great Detective goes, murder is bound to follow. Alleyn finds himself mixed up with a company of actors - the Carolyn Dacres Comedy Company. The company is run by two partners, Alfred Meyer and George Mason, and the leading lady is the lovely Carolyn, who just happens to be married to Meyer, and is an object of admiration for one of her fellow actors. An incident on board a train seems to suggest that Meyer's life may be at risk, and before long, at a celebration of Carolyn's birthday, he is killed in a very original fashion. A jeroboam of champagne was due to descend from the ceiling as part of the festivities. But someone has tinkered with it, and it duly crashes down, killing Meyer. So -whodunit? Alleyn is only a bystander, but he soon finds himself drawn into the investigation. The local police come very close to tugging their forelocks when confronted by the great man from Scotland Yard. "We've all been trained on your book," they tell him. "It's - it's a great honour to meet the author." Ah yes, a footnote reminds us that Alleyn is responsible for a little tome called Principles and Practice of Criminal Investigation. Marsh switches the focus of suspicion from one character to another with considerable ease. I felt that the psychology of the culprit wasn't exactly clear (or am I just miffed because I didn't figure out who was responsible?) but the writing style is easy and pleasant, and Marsh conveys her love of theatrical life very well. All in all,a good read. It will be fascinating to see what Stella Duffy, who shares a good deal in common with Marsh, will make of her forthcoming "continuation novel" based on an incomplete manuscript. If you asked me to pick the most memorable character in the crime fiction of the 21st century, then I don't think I'd look any further than Stieg Larsson's Lisbeth Salander. She is wholly distinctive and yet somehow very much in the tradition of the maverick detective. So during a brief trip to Stockholm from which I've just returned, I enjoyed making a pilgrimage to one of her favourite hang-outs, the old beer hall Kvarnen, which features in The Girl with the Dragon Tattoo. And the food was excellent - they did a very good special meatballs dish, one of the local favourites. Scandinavian noir fiction has been all the rage for more than a decade now, and yet Stockholm is a thriving and (at least from the perspective of a tourist) highly civilised city, not perhaps the most obvious setting for murder and mayhem. We were lucky to have a well informed guide, one Catherine Edwards, whose first job since graduating is as a journalist for The Local, based in Sweden. This was my second trip to Stockholm, the first having been a one day stop during a Baltic capitals cruise, and the visit reinforced my enthusiasm for the city. There's plenty to see, far more than a few days' worth of sights. The Moderna Museet, tucked away on one of the city's many islands, is impressive, and so is the charming old town, Gamla Stan. Skansen, the world's first open air museum, is also packed with interesting things to see. Stockholm is sometimes called "the Venice of the North", and although it's a misleading comparison, because the two cities are utterly different, with so much water, there is the chance to take some fascinating boat trips. Our voyage to the fabulous Drottningholm Palace on a sunny day was especially memorable. And so was a Father's Day dinner cooked in her flat by Catherine. Less than three years after we lost that fine crime writer Robert Barnard, it's good to see that Bello are making a bit of a splash with his extensive backlist. In particular, they have reissued two of this books in attractive paperback editions, which have some of the nostalgic feel associated with the cover artwork of the British Library's Crime Classics series. There's no doubt that the success of the British Library series has been enormously influential -it's the reason why you will again see plenty of crime books with seasonal covers this year, as you did last, and why so many traditional mysteries are now being reissued with lovely covers that cater for a touch of nostalgia among readers. Bob was a witty exponent of the traditional mystery, and had strong views about it. "Second murders are always vulgar", he once said, with tongue perhaps slightly in cheek. He deplored formulaic writing, and although he did have series characters, such as Perry Trethowan and Charlie Peace, they were not as memorable as, say, Dalziel and Pascoe, but really represented a convenient way of tackling the business of solving a murder puzzle. 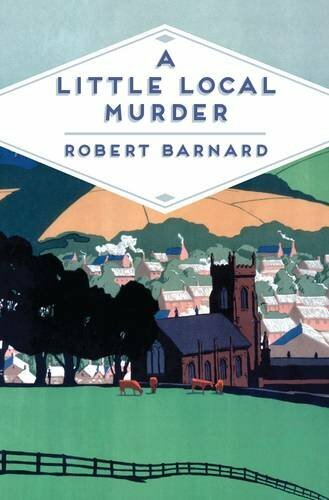 A Little Local Murder, one of the two new paperbacks, is characteristically clever, not least because Bob toys with his reader's expectations. It seems to be predictable who will be murdered - but he turns the tables on us very neatly. This is a village mystery somewhat in the Christie vein (and Bob was a great admirer of Christie; I heard him give two excellent talks about her, and his book A Talent to Deceive remains an excellent study of her work) but with a character of its own. I'm sure that Bob, mischievous as he was, would be greatly amused to see that The Case of the Missing Bronte is also being highlighted in the new edition. He once told me it was his worst book, and then relented slightly when inscribing a copy to me - describing it as "my second worst book". He was a harsh judge of his own work, but I must admit it's not one of his best. This is so despite the fact that he was a great expert on the Brontes, and once led a fascinating tour for fellow crime writers around Haworth Parsonage: a memorable afternoon indeed. So which Barnard title is my favourite? I'd probably plump for A Scandal in Belgravia. Enter Sir John was the first joint novel authored by two friends, the playwright Clemence Dane, and Helen Simpson. A brief foreword credits the publisher C.S. Evans for coming up with the idea of the collaboration and the story, which introduces the egocentric but appealing actor-manager Sir John Samaurez (real name Johnnie Simmonds). He appeared in two later novels by the pair before their literary partnership came to an end. The story is set in the theatrical world that both authors, and in particular Dane, knew very well. Martella Baring is accused of murdering her unpleasant colleague Magda Druce, and the evidence against her seems to be damning. She is tried, found guilty, and sentenced to death, having done nothing to help herself when appearing in the witness box. Sir John, who had previously met Martella and taken a shine to her, attends the trial and becomes convinced of her innocence. She continues to be reluctant to co-operate, in the gallant yet infuriating way of so many Golden Age suspects. But Sir John is undaunted, and eventually uncovers the truth. it has to be said that, as a detective story, this one is nothing special; the puzzle is perfunctory. The writing and characterisation (by the standards of the time) are what lift it out of the ordinary. The question of racism is also addressed,in a way that - again by the standards of 1929 - is quite thought-provoking. The story was vivid enough to appeal to Hitchcock, who filmed it as Murder!, a movie I reviewed here more than four years ago. There are also elements which, as Liz Gilbey noted in a an excellent article for CADS a while back, anticipate a much better known book by a friend and Detection Club colleague of the authors - Dorothy L. Sayers, whose Strong Poison offers a cunning howdunit puzzle. Enter Sir John isn't as good as the Sayers novel, but it's interesting, nonetheless. Tomorrow sees the official publication of the Detection Club's first collaborative novel for more than half a century. The Sinking Admiral was masterminded by Simon Brett, and is the work of fourteen members of the Club, including me. There's a launch, incidentally, this evening at Goldsboro Books in Cecil Court, London. Do come along if you are in the area; the launch is from 6 pm for an hour or so. 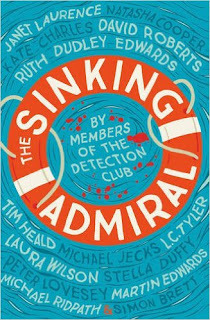 The book is, as its title implies, to some extent a homage to The Floating Admiral, the classic round robin mystery which the Club's founder members produced in 1931. But it's very much a contemporary mystery, with plenty of touches of humour (you'd expect nothing less from a gang of contributors that includes Simon, Ruth Dudley Edwards, and Len Tyler). I contributed one chapter, and found it fun to write. Equally entertaining were the sessions we had - usually in pubs, it has to be said, when we were planning the storyline (you can see that some of the plot complications caused Janet Laurence momentary despair, but needless to say, she sorted them out).. However, we did reach a point, with a couple of chapters to go, where we still had not decided on the solution. Simon duly organised an unforgettable dinner at the Groucho Club where we worked it all out, and elected two brave souls to do the necessary writing. Harper Collins are the publishers, and I think they've done a lovely production job: I really like the cover artwork, and the reality of publishing is that such things do make a difference to the way in which a book is perceived in the trade, and by readers. More than that, this is an unusual and innovative novel. Whilst it's not to be taken too seriously, of course, I'm very optimistic that it will supply lovers of twisty, light-hearted mysteries with a great deal of entertainment. .
During my conversation with Rob Davies of the British Library, we also announced that next year will see the publication of my new non-fiction book The Story of Classic Crime in 100 Books. This book has occupied a good deal of my time over the past 18 months, and I recently finished work on the manuscript. It's very different from The Golden Age of Murder, even though there is an element of overlap in terms of the period covered, and I hope that crime fans will find it full of interesting - and often unexpected - material. The first session of the day featured another book with which I'm very happy to be associated. This is The Sinking Admiral, by the Detection Club. Simon Brett, who masterminded the book, discussed it with me, and two other contributors, Janet Laurence and Stella Duffy. It was also announced that Stella has been awarded an OBE, and that she has been engaged to write a completion of an unfinished Ngaio Marsh novel: something to look forward to. As for The Sinking Admiral, it sold out by mid-morning. Tony Medawar talked about Anthony Berkeley, while Len Tyler and Susan Moody championed Philip MacDonald and Georgette Heyer, and Barry Pike discussed the work of H.C. Bailey. Dolores Gordon-Smith focused on G.K. Chesterton, while Jennifer Henderson, biographer of Josephiine Tey, talked about Tey as a Scottish writer. John Curran discussed the Collins Crime Club - and his book on the subject is another that will be eagerly anticipated. Finally there was a group panel in which we picked favourite screen adaptations of Golden Age novels. Dinners on the Friday and Saturday evenings provided plenty of opportunities for socialising, and I was delighted to meet Taku Ashibe, from the Honkaku Mystery Writers' Club of Japan, (modelled on the Detection Club) who presented me with several books, including one of his own. Saturday itself was extremely hectic, and although I had the chance to chat to a number of attendees, there simply wasn't time for as many conversations as I'd have liked. But you can't have everything, and overall this was a wonderful day, full of good things, and pleasant people. What more could you want? The photo at the top of this post appears on an account of the day on Puzzle Doctor's splendid blog, In Search of the Classic Mystery Novel. Further perspectives on the day may be found on the similaly enjoyable Past Offences blog and Cross Examining Crime. I''m having something of a binge on the works of John Dickson Carr at present, and my Forgotten Book for today is his fifth novel, Poison in Jest. Here he moved away from the French setting of his early books to the US, although the prologue and epilogue are set in Vienna. Henri Bencolin, Carr's first super sleuth, is mentioned in passing, but does not appear in person; Jeff Marle, however, continues in his role as narrator. The Great Detective here is Patrick Rossiter, an Englishman who sees himself as something of an exorcist, and who was perhaps a prototype of Dr Gideon Fell. However, he arrives in the story at a relatively late stage, after an intriguing set-up. Some very strange things are happening in the household of Judge Quayle, up in the mountains of western Pennsylvania. A disembodied hand from a statue keeps making an appearance (although it has to be said that this element of the story is not developed quite as one would expect). After the apparent failure of an attempted poisoning, murder is committed. The atmosphere of the decaying mansion and the tensions between members of the dysfunctional family who live in it are wonderfully conveyed. Carr's ability to conjure up macabre settings was one of his great strengths, and the powerfully Gothic quality of this novel is in my opinion its outstanding feature. The mystery is competently handled, with a pleasing "least likely person" culprit, but is not quite gripping enough for me to rank this as one of Carr's best books. Indeed, according to Doug Greene's biography, the author soon became rather dismissive of it. Yet while I don't think it is the best introduction to Carr's work for the uninitiated, it's still a lively read. As others have said, even a novel that is second-rate Carr is likely to be superior to the best work of many other writers of traditional mysteries. On a flight from France, Chance (played by John Justin) makes the acquaintance of a young woman called Helen (Margaret Leighton). She happens to be reading one of his books and they start chatting. When he tells her that he's flying home to discuss the possibility of writing a book about a dead test pilot called Martin Teckman, she reveals that she is Teckman's sister. It also emerges that a woman who had been working on the Teckman has died, apparently in an accident. Once back in London, Chance finds that his home has been burgled, but nothing has been stolen. He is then approached by a mysterious foreigner and offered a vast sum to fly to Berlin and write a series of articles. Can it be that someone wants Chance out of the way, so that he does not make progress with the Teckman book? We can guess the answer to that one, can't we? There are some recognisable faces in the cast, including Michael Medwin (still fondly remembered as Don, the boss of Eddie Shoestring in that great show Shoestring) and Raymond Huntley. There's also a cameo appearance by Justin's then wife, Barbara Murray. This isn't a Durbridge classic, partly because Justin gives a far from compelling performance, and partly because the story doesn't boast one of his most cunning plots, but it's quite an agreeable time-passer. Disclaimer is a debut novel by Renee Knight which has enjoyed massive success, selling worldwide and earning a film option. It's a psychological thriller, clearly targeted at the Gone Girl market, told from two contrasting viewpoints: those of the hunter and his prey. The opening premise is superb. The tagline on the cover sums it up neatly: Imagine if the next rhriller you opened was all about you. Catherine Ravenscroft, a middle-aged woman who has pursued a highly successful career in TV, finds a novel called The Perfect Stranger on her bedside table, she doesn't know where it has come from, but starts reading, and finds to her horror that it tells a story about the most horrific experience of her own life, one she had believed was safely buried in the past. I love this idea - it's a variant on a very clever concept that (for instance) John Franklin Bardin played with almost seventy years ago in The Last of Philip Banter, but it's handled in a pleasingly original fashion. We soon discover that the author of the mysterious book is a man called Stephen, a retired teacher whose wife has died recently, and who is pursuing an agenda as a result. Stephen's obsessiveness and mental disintegration is revealed gradually, while Catherine's own seemingly perfect life begins to fall apart. Shelley Smith followed up her debut, the enjoyable Background for Murder , with a novel first published in 1945, Death Stalks a Lady. Here she moves away from the private eye story to a "woman in jeopardy" mystery very much in the style of Ethel Lina White, who had died not long before the book appeared. And Smith shows that she is equally adept at this kind of story. Judith Allen returns to her family home after ten years away, an absence consequent upon her parents's divorce, and immediately stumbles across the body of a woman in a car. The deceased bears a superficial resemblance to her, and was going under the name of....Judith Allen. This is a fascinating plot device,and although the plotting of the mystery is a little uneven, overall this is a crafty whodunit which - even at this early point of Smith's career- demonstrates her skill as a writer. The plot quickly thickens. Judith falls in love, but we learn that she's an heiress, and people have reason to wish her ill. Can she even trust the handsome chap she's fallen for? Another death occurs, and the pace never lets up. It's all perfectly enjoyable, and I galloped through the story. In the Fifties, Smith would write even more accomplished crime fiction, but her early books are also entertaining. My copy is inscribed by Smith to a reader, and accompanied by a postcard in which she says that her radio play about the "wicked bank manager",called No Wreath for Susan, is due to be broadcast shortly on the Home Service. I imagine that no copies exist of that play - though I haven't yet checked - but I must say I'm intrigued. Smith was an energetic and capable writer, and the only surprise to me is that her enthusiasm for writing novels seemed to fade after the early 60s. Eden Lake, a film released in 2008, is often described as a thriller, but I'd say that it's closer in mood to a horror movie. There are several very frightening scenes, and a good deal of graphic violence. It's definitely not for the faint-hearted. In the early stages, it resembled In Fear, but it soon takes off in a different, and more explicit direction. Overall, it's a powerful and unsettling. A gang of feral teenagers start to terrorise the couple; these are hoodies you definitely wouldn't wish to hug, with a female member of the gang recording her chums' violence on her phone, in a way that, frighteningly, has happened in a number of real life cases. Fassbender is good, but Kelly Reilly, an actor previously unknown to me, is truly excellent. But will she manage to escape the kids hunting her down? A good article by Alex Hess in the Guardian highlights the horrific aspects of the story. I'm inhibited from saying much more because I don't want to include a spoiler, but suffice to say this is a very dark film indeed. James Watkins wrote and directed, and the screenplay certainly packs a punch Not for the squeamish, that's for sure..